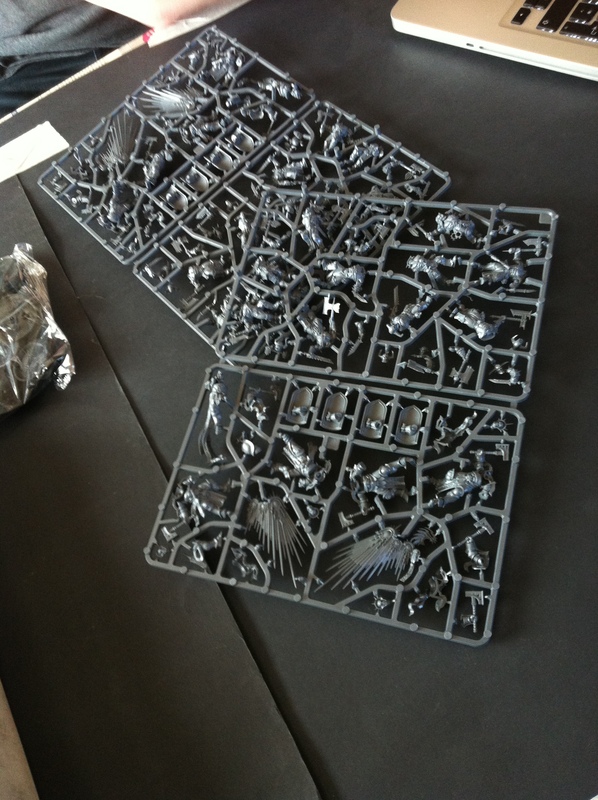 K: “These Khornate sprues are just loaded with so many cool parts, perfect for my Red Corsairs project! I think I can already see some of these turning into Chaos Space Marine Scouts! K: “Totally, but hey! you seem to get all of those 40mm’s!!!!!!! M: “Sad” The level of the artwork in this book makes me really sad…. 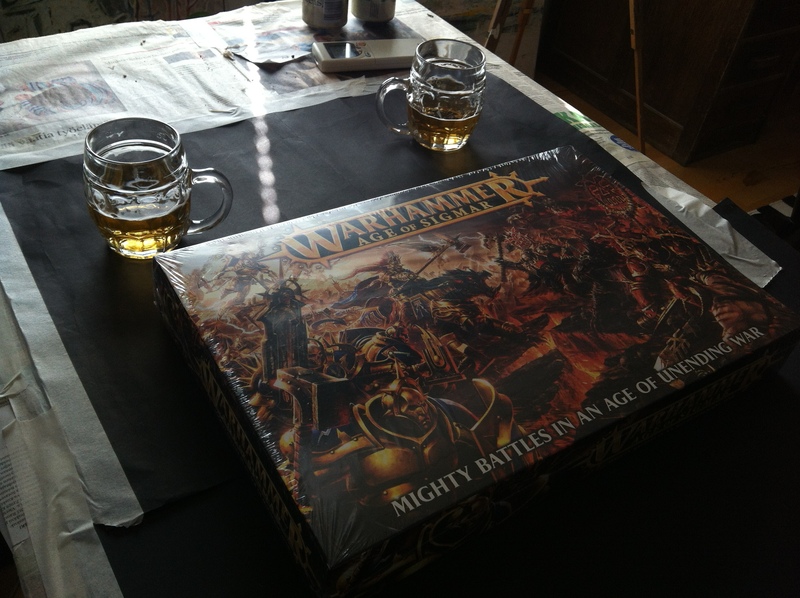 M: “But the miniatures that come with the box are ABSOLUTELY GOLD!!!!!! 28mm of the 80’s compared to the 28mm of the 2015!!!! Oh yeah… you are committed now guys – can’t wait to see what you do with this set! I don’t think it’s fair to shoot down the art in that little book. Most of it is amazing and certainly wouldn’t be considered “hastily prepared digital ones”. Remember that Blanche is the Art Director for GW so he has a hand in everything, even if he hasn’t contributed himself. 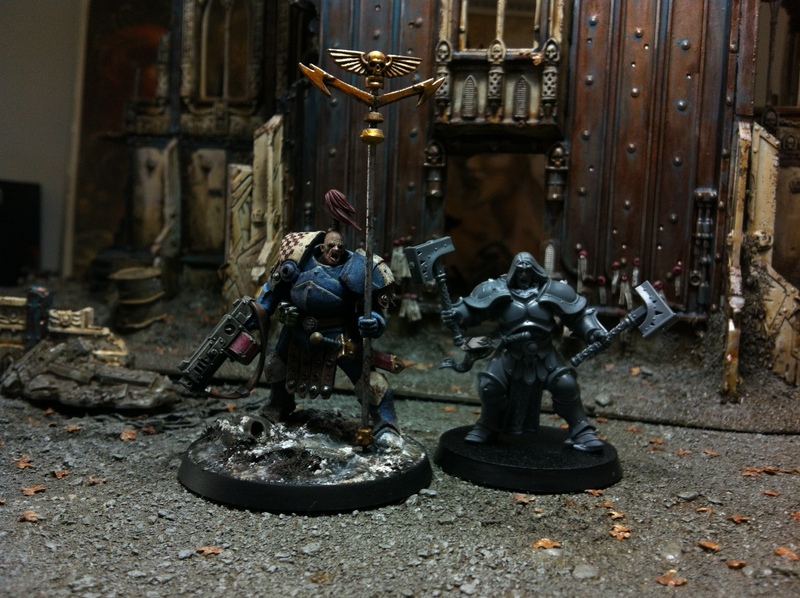 As for the new models, I think they are quite good, and prefect for all manner of conversions. I cannot wait to see some new Thunder Warriors. And Corsair scouts sounds very promising too! 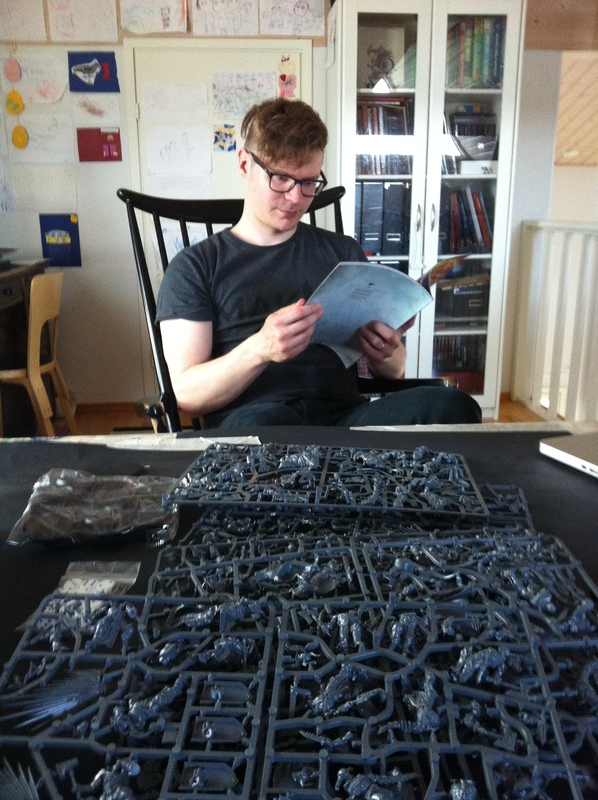 Uh-oh, that DA book really looks weak… Karl Kopinski sure brought good fuel to the 40k universe. 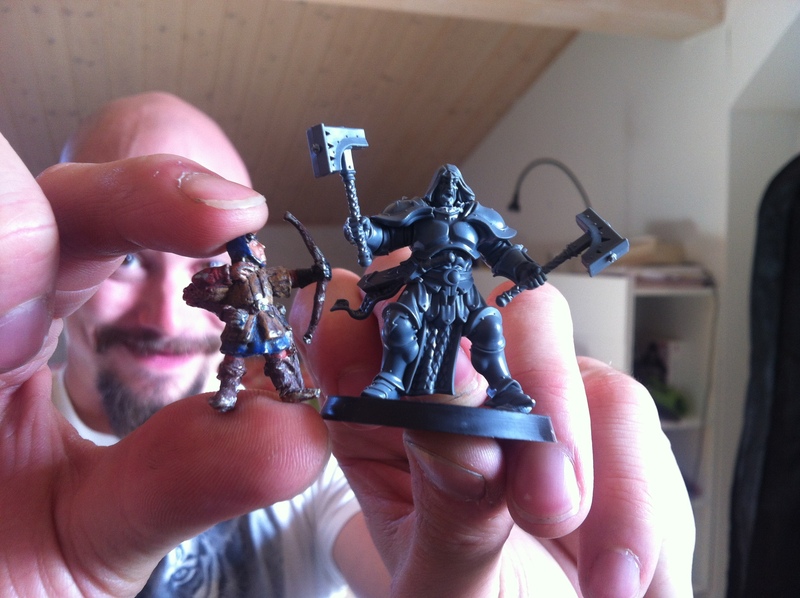 About my critique regarding the art in the AOS rulebook. The overall quality of the art is very good – maybe a bit repetitive for time to time IMO – and you can tell that the artists are very talented in their field of expertise. But the thing is, I have been staring the video game concept art the best part of my life, and feel that the art in the AOS is very similar to that genre; it’s very generic and mainstream, something that will no doubt hit in the most hobbyists. It’s like the art of AOS doesn’t even want to take any risks at failing. But me, it makes a bit sad. It’s not the aesthetics of the characters (the design of them stands out pretty well and is unique in many ways), but I like spotting details from the background of the images, and some of the pieces in AOS just lack that part. Might have been the extreme deadlines pushing the artists to their limits and finding shotcuts though… And I’m not that much of a fan when it comes to things painted with digital platform either. I see what you mean Kari. I think one aspect that really hurts the art, even some of this better executed stuff, is that it is all just depicting the models that come in the box. The old Kopinski stuff was so great because each was brimming with the artists own imaginative creations, foreground and background. Ultimately, I am just happy that at least the art in this AOS book is at least well done, because some of the other 40k books just aren’t anymore. First, the visual consistency of the illustrations in relation to the models. Over the last few years we have seen this taken to a greater degree than previously, to the point where most things present in an illustration are available as a models. And while this has always been the case more-or-less, I think the main thrust behind it is to keep an already bursting potentially-uncontrollable IP controlled, and growing where it needs to. Without that control, too many illustrators would slip in too many idiosyncrasies, diluting the IP. Second, the increased share of duties to freelance illustrators. GW obviously still has an in-house art department, but in recent years they have opened up opportunities to freelancers. The trouble in that is that many freelancers don’t fully understand the IP, and some of the ones that get jobs haven’t had a lot of time to develop a sensitivity to the IP in order to render it with confidence and panache. It’s perfectly reasonable to uphold the work of Kopinski and Dainton as the epitome of fully-realised grimdark (and I am a die-hard Dainton fan), but keep in mind that these guys sport incredible draughtsmanship that is only attained from years of experience working from an academic art standpoint. Phiq, “Nope, there’s none, only hastily prepared digital ones.” – That might have been a bit over dramatic depiction of the thoughts that the art in the rulebook arouse in me while I was browsing it. Often I’m not very good at putting my thoughts in to words, and clearly this wasn’t one of those moments either. My intention was to say that I was disappointed to see so many picture perfect poster images of the new era that somehow lacked the momentum and roughness, the kind the old narrative imaginary of artists such as Kopinski/Dainton were able to pull out of the GW IP. Yes, the new game is just planting its fresh roots on the hobby ground, so there may not yet be that much to show off at the moment. And yes, I haven’t been a keen fan of the current art style of the GW for a long time. I have my own reasons and don’t expect others to fully understand them. You could describe it as a rebellious act against public conception of what is “perfect” and what is not, or what ever. Its a long story, which I may share at some point in this blog. Never the less, your point was well argued and very illustrative. Didn’t mean to insult any of the fantastic artists both at the GW and freelancing for them with my comments. My intention was just to give my interpretation of the art that I felt in that very moment I browsed the book. Hey Kari, thanks for your reply. All good, all understood 🙂 Ultimately, I’d say I agree with you on the art issue. Though personally, I can deal with a dialing-back of the grimdark, so long as the design sense is still strong. Thankfully GW are still very sharp in that regard. I’ve bought a box too, but I’m finding it really hard to decide what to do with it. Part of me it very tempted to just built them straight out of the box as intended because they are gorgeous minis in their own right. On the other hand the Sigmarites are crying out to be converted into marines of some kind. I think I may end up building the boxed set straight but buying more to convert. I keep looking at them and seeing the potential for either Emperor’s Children or Alpha Legion. If you turn those Sigmarites into Thunder Warriors, they have the be art-scaled. The bar has been set so high with your previous TW, they’ll look like junior versions if they aren’t scaled up. You bet Odie! They will be art-scaled alright:) but already feeling sorry for myself for that is ALOT of work!!! Yep, it looks like the poses include lots of elements that make it really hard to add more height to the character, such as loincloths etc. Yeah, I don’t envy that job at all. Not the art art director, changed jobs – in the last couple of years of employment , 67 in three months, utilising mi tyme in embedded within the scuplting department sketching concepts …..
Mr Blanche, why did you let them kill Warhammer?